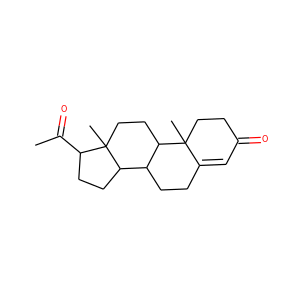 Dextropropoxyphene is an analgesic in the opioid category, patented in 1955 and manufactured by Eli Lilly and Company. 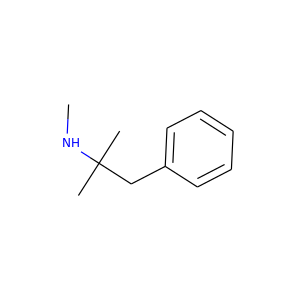 It is an optical isomer of levopropoxyphene. It is intended to treat mild pain and also has antitussive (cough suppressant) and local anaesthetic effects. The thyroid hormones are tyrosine-based hormones produced by the thyroid gland that are primarily responsible for regulation of metabolism. T3 and T4 are partially composed of iodine (see molecular model). A deficiency of iodine leads to decreased production of T3 and T4, enlarges the thyroid tissue and will cause the disease known as simple goitre. 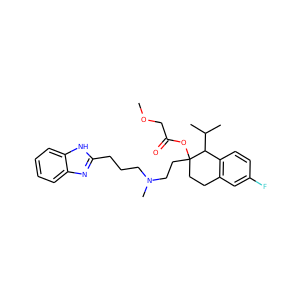 Tadalafil (INN) is a PDE5 inhibitor marketed in pill form for treating erectile dysfunction (ED) under the name Cialis see-AL-iss, and under the name Adcirca ad-SUR-kə for the treatment of pulmonary arterial hypertension. In October 2011 the U.S. Food and Drug Administration (FDA) approved Cialis for treating the signs and symptoms of benign prostatic hyperplasia (BPH) as well as a combination of BPH and erectile dysfunction when the conditions coincide. Mephentermine is a cardiac stimulant. It was formerly used in Wyamine nasal decongestant inhalers and before that as a stimulant in psychiatry. It has been used as a treatment for low blood pressure. 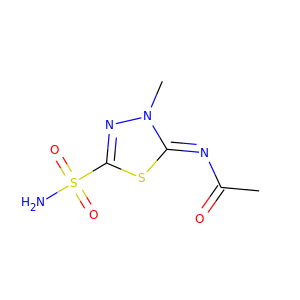 Hydroflumethiazide (or Saluron) is a diuretic. Alfuzosin (INN, provided as the hydrochloride salt) is a pharmaceutical drug of the α1 blocker class. As an antagonist of the α1 adrenergic receptor, it works by relaxing the muscles in the prostate and bladder neck, making it easier to urinate. It is thus used to treat benign prostatic hyperplasia (BPH). 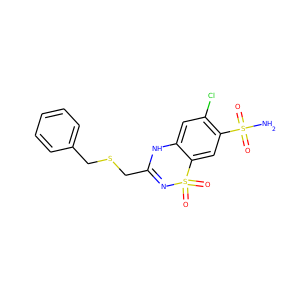 Guanabenz (pronounced GWAHN-a-benz, sold under the trade name Wytensin) is an alpha agonist of the alpha-2 adrenergic receptor that is used as an antihypertensive drug. It is used to treat high blood pressure (hypertension). The most common side effects during guanabenz therapy are dizziness, drowsiness, dry mouth, headache and weakness. 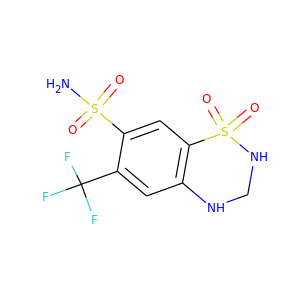 Clofibrate (tradename Atromid-S) is an organic compound. It is marketed as a fibrate. It is a lipid-lowering agent used for controlling the high cholesterol and triacylglyceride level in the blood. 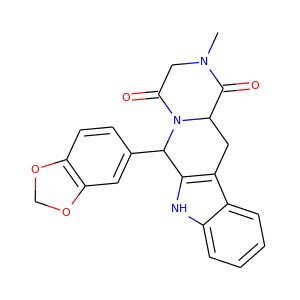 Quinethazone (INN, brand name Hydromox) is a thiazide-like diuretic used to treat hypertension. Common side effects include dizziness, dry mouth, nausea, and low potassium levels. 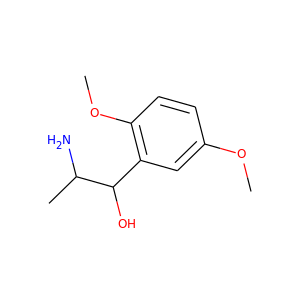 Methoxamine is an α1-adrenergic receptor agonist, somewhat similar in structure to butaxamine and 2,5-DMA. 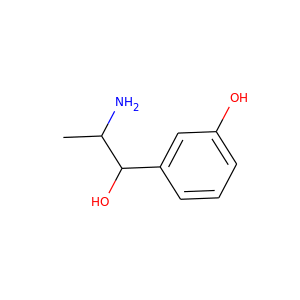 It is no longer marketed..
Metaraminol (INN; trade names Aramine, Metaramin, and Pressonex), also known as metaradrine, a stereoisomer of meta-hydroxynorephedrine (3,β-dihydroxyamphetamine), is a potent sympathomimetic amine used in the prevention and treatment of hypotension, particularly as a complication of anesthesia. 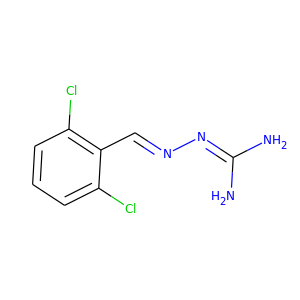 It is an α1-adrenergic receptor agonist with some β effect. Metaraminol is also used in the treatment of priapism. 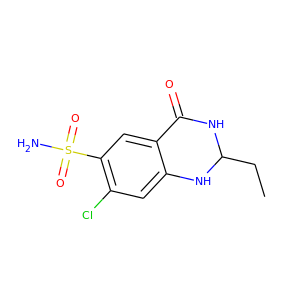 Benzthiazide (BAN/INN, also known as benzothiazide; trade names Aquatag, Dihydrex, Diucen, Edemax, Exna, Foven and others) is a thiazide diuretic used in the treatment of high blood pressure and edema. It is no longer available in the United States. In the United Kingdom, it was also sold in combination with the potassium-sparing diuretic triamterene under the trade name Dytide. 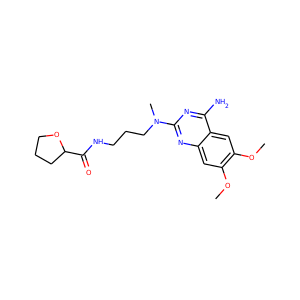 Fluocinolone acetonide is a corticosteroid primarily used in dermatology to reduce skin inflammation and relieve itching. 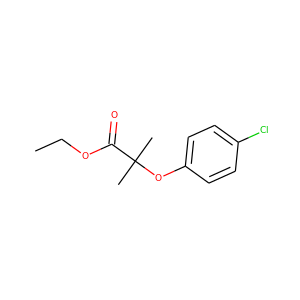 It is a synthetic hydrocortisone derivative. The fluorine substitution at position 9 in the steroid nucleus greatly enhances its activity. 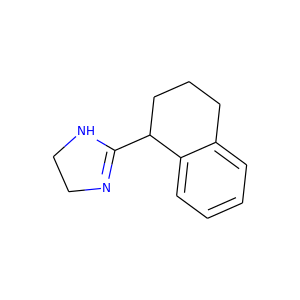 Methazolamide (trade name Neptazane) is a potent carbonic anhydrase inhibitor. It is indicated in the treatment of increased intraocular pressure (IOP) in chronic open-angle glaucoma and secondary glaucoma. Also it is used preoperatively in acute angle-closure (narrow-angle) glaucoma where lowering the IOP is desired before surgery. 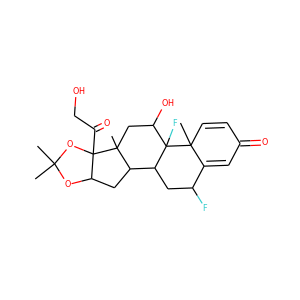 Mibefradil (Posicor) is a drug for the treatment of hypertension and chronic angina pectoris. It belongs to a group known as calcium channel blockers. The mechanism of action of mibefradil is characterized by the selective blockade of transient, low-voltage-activated (T-type) calcium channels over long-lasting, high-voltage-activated (L-type) calcium channels, which is probably responsible for many of its unique properties. Tetryzoline (INN; also known as tetrahydrozoline), a derivative of imidazoline, is found in over-the-counter eye drops and nasal sprays. 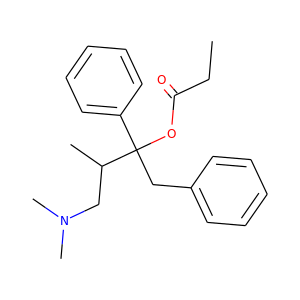 Other derivatives include naphazoline, oxymetazoline, and xylometazoline. 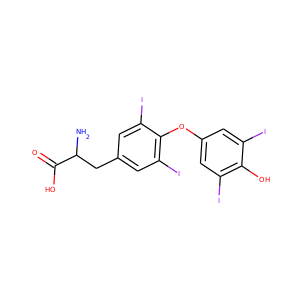 Tetrahydrozoline is an alpha agonist and its main mechanism of action is the constriction of conjunctival blood vessels. 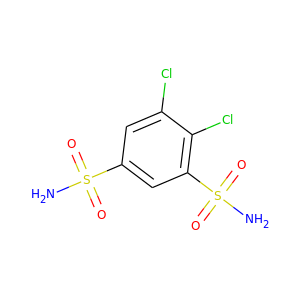 Diclofenamide (or dichlorphenamide) is a sulfonamide and a carbonic anhydrase inhibitor of the meta-disulfamoylbenzene class.